For about $(removed) you can buy a credit card sized circuit board that has input connections (for buttons, knobs, light sensors, microphones, humidity sensors, fart detectors, Internet signals, etc) and output connections (for servo motors, LEDs, buzzers, speakers, stepper motors, vibrators, etc). You write programs on your computer to tell the Arduino how to process the input signals and how to activate the output components. This program is uploaded to the Arduino's microprocessor, making it self-contained. The Arduino website has good getting started information, but the best guide for beginners is Getting Started with Arduino ($(removed)), co-written by Massimo Banzi, the co-founder and beloved face of Arduino. This book will get even the greenest newbie up and running. 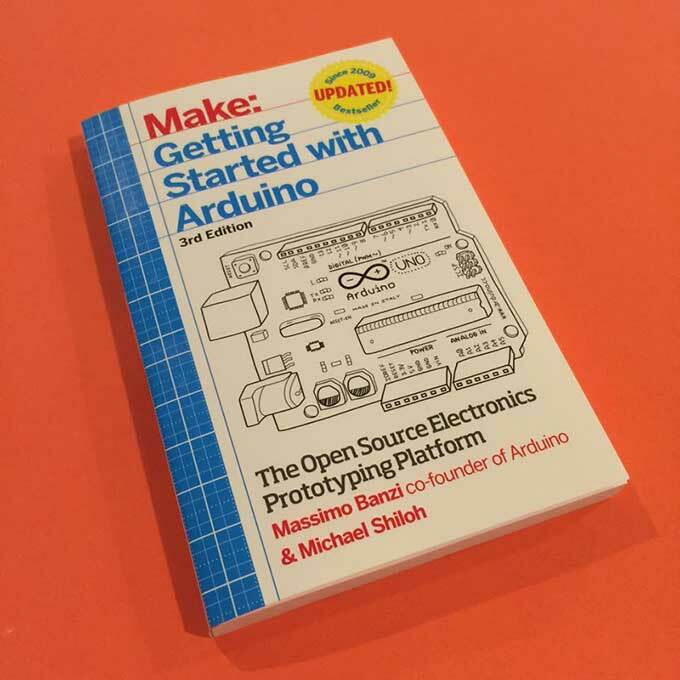 It is the book I read to learn Arduino and the one I always recommend to anyone who asks me how to get started. It starts by explaining what the Arduino is and how it works, then presents projects of increasing complexity that teach you the capabilities of the Arduino. It has a chapter on how to connect an Arduino to the Internet and make a lamp that responds to to occurrence of certain keywords it finds on websites. The final project is a system that detects the moisture level in your houseplants plants and automatically waters them.